... but it's never too late to celebrate the former wrestling champ's undisputed contributions to the world of song. 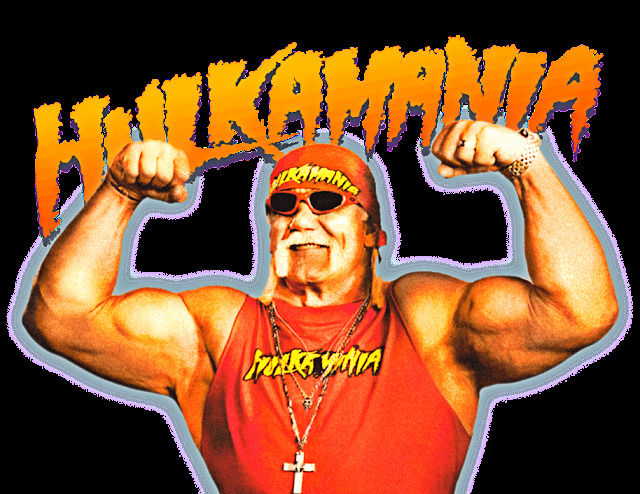 Hogan, born Terry Bollea, turned 64 on Friday Aug. 11. Let's face it. Hulk Hogan has created this generation's Dark Side of the Moon! This amazing album takes you on a roller coaster ride both musically and emotionally. But, just like most great albums, it leaves you wanting more. From Johnny Cash to Liberace, from Elvis Pressley to Chopin, it is clear that Hulk Hogan belongs in the upper echelon of the music industry. Listening to this album may lead to 26" Pythons and extreme awesomeness. I popped it in before my workout one day and when I blacked back in, a month later, I found my shirt had me in a strangle hold. Luckily the fabric was no match for my now massive triceps and I shredded it to pieces in seconds. I dedicate these songs to my Hulkamaniac cronies Chuck and Scott who love Hulk Rules nearly as much as I do. Keep training, taking your vitamins and saying your prayers, boys! Let's start with this anthem. This next one, "I Want to Be a Hulkamaniac," shows Hogan's mad skills as a rapper. If you can listen to this one all the way through without weeping openly, you're a tougher Hulkamaniac than me. Finally, as a bonus, here's Hogan's official entrance song, "Real American."